This article explains how to use the Recovery Services vault Overview dashboard to monitor and manage your Recovery Services vaults. When you open a Recovery Services vault from the list, the Overview dashboard for the selected vault, opens. The dashboard provides various details about the vault. There are tiles that show: the status of critical and warning alerts, in-progress and failed backup jobs, and the amount of locally redundant storage (LRS) and geo redundant storage (GRS) used. 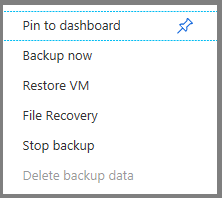 If you back up Azure VMs to the vault, the Backup Pre-Check Status tile displays any critical or warning items. The following image is the Overview dashboard for Contoso-vault. The Backup Items tile shows there are nine items registered to the vault. 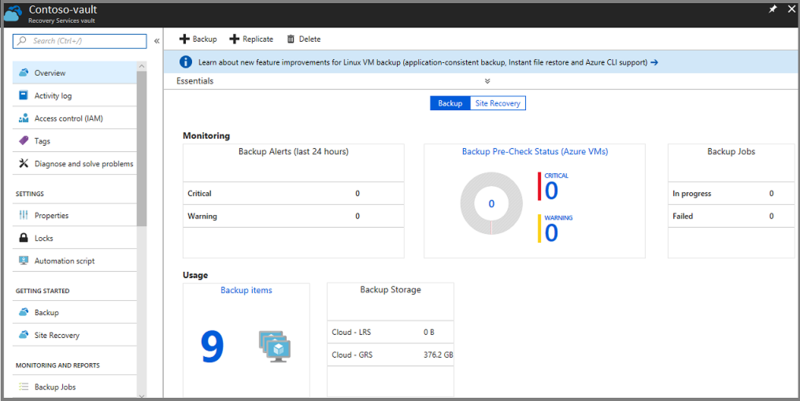 The prerequisites for this article are: an Azure subscription, a Recovery Services vault, and that there is at least one backup item configured for the vault. To monitor alerts, or view management data about a Recovery Services vault, open the vault. In the portal, click All services. In the All services dialog box, type Recovery Services. As you begin typing, the list filters based on your input. When the Recovery Services vaults option appears, click it to open the list of Recovery Services vaults in your subscription. From the list of vaults, click a vault to open its Overview dashboard. The Overview dashboard uses tiles to provide alerts and backup job data. The Recovery Services vault Overview dashboard provides tiles for Monitoring and Usage information. The tiles in the Monitoring section display Critical and Warning alerts, and In progress and Failed jobs. Click a particular alert or job to open the Backup Alerts or Backup Jobs menu, filtered for that job or alert. 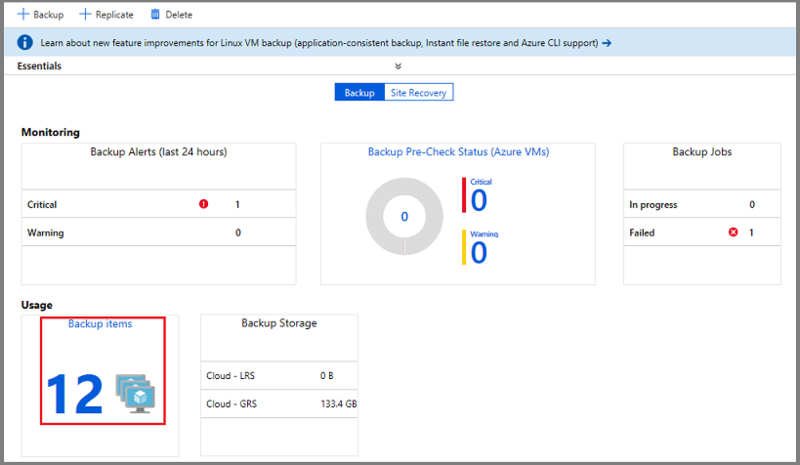 Pre-check status for Azure VMs - For complete information on the pre-check status, see the Backup blog on Backup Pre-check status. The Backup jobs in progress, and jobs that have failed (in the last 24 hours). The number of Backup items configured for the vault. The Azure storage (separated by LRS and GRS) consumed by the vault. Click the tiles (except Backup Storage) to open the associated menu. In the image above, the Backup Alerts tile shows three Critical alerts. 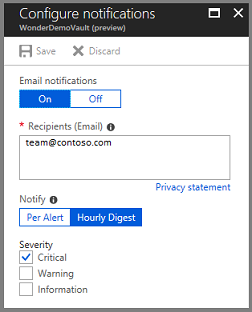 Clicking the Critical alerts row in the Backup Alerts tile, opens the Backup Alerts filtered for Critical alerts. The Backup Alerts menu, in the image above, is filtered by: Status is Active, Severity is Critical, and time is the previous 24 hours. 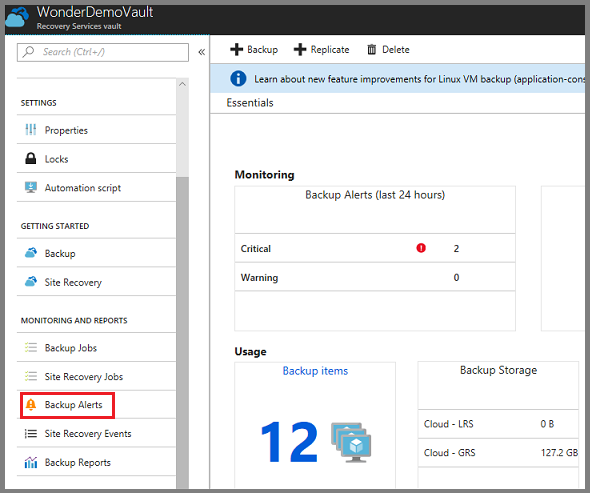 To access the Backup Alerts menu, in the Recovery Services vault menu, click Backup Alerts. The Backup Alerts report lists the alerts for the vault. The Backup Alerts list displays the selected information for the filtered alerts. In the Backup Alerts menu, you can filter for Critical or Warning alerts. Critical You receive critical alerts when: Backup jobs fail, recovery jobs fail, and when you stop protection on a server, but retain the data. Warning You receive warning alerts when: Backup jobs complete with warnings, for example when fewer than 100 files are not backed up due to corruption issues, or when greater than 1,000,000 files are successfully backed up). Informational currently, no informational alerts are in use. The Backup Alerts report tracks eight details about each alert. Use the Choose columns button to edit the details in the report. By default, all details, except Latest Occurrence Time, appear in the report. To change the report information, in the Backup Alerts menu, click Choose columns. The Choose columns menu opens. In the Choose columns menu, choose the details you want to appear in the report. Click Done to save your changes and close the Choose columns menu. If you make changes, but don't want to keep the changes, click Reset to return the selected to the last saved configuration. Use the Filter menu to change the Severity, Status, Start time and End time for the alerts. Editing the Backup Alerts filter doesn't change the Critical or Warning alerts in the vault Overview dashboard. To change the Backup Alerts filter, in the Backup Alerts menu, click Filter. Edit the Severity, Status, Start time, or End time, and click Done to save your changes. Configure notifications to generate emails when a Warning or Critical alert occurs. You can send email alerts each hour, or when a particular alert occurs. By default, Email notifications are On. Click Off to stop the email notifications. On the Notify control, choose Per Alert if don't want grouping or don't have many items that could generate alerts. Every alert results in one notification (the default setting), and a resolution email is sent immediately. If you select Hourly Digest, an email is sent to the recipients explaining the unresolved alerts generated in the last hour. A resolution email is sent out at the end of the hour. Choose the alert severity (Critical or Warning) used to generate email. Currently there are no Information alerts. A Recovery Services vault holds many types of backup data. For a complete list of backup types, see Which applications and workloads can be backed up. To manage the various servers, computers, databases, and workloads, click the Backup Items tile to view the contents of the vault. The list of Backup Items, organized by Backup Management Type, opens. 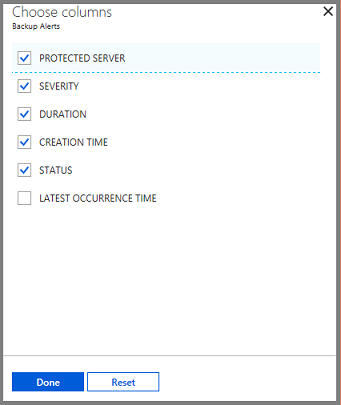 To explore a specific type of protected instance, click the item in the Backup Management Type column. For example, in the above image, there are two Azure virtual machines protected in this vault. Clicking Azure Virtual Machine, opens the list of protected virtual machines in this vault. The list of virtual machines has helpful data: the associated Resource Group, previous Backup Pre-Check, Last Backup Status, and date of the most recent Restore Point. The ellipsis, in the last column, opens the menu to trigger common tasks. The helpful data provided in columns, is different for each backup type. 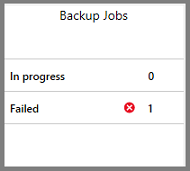 The Backup Jobs tile in the vault dashboard shows the number of jobs that are In Progress, or Failed in the last 24 hours. The tile provides a glimpse into the Backup Jobs menu. To see additional details about the jobs, click In Progress or Failed to open the Backup Jobs menu filtered for that state. 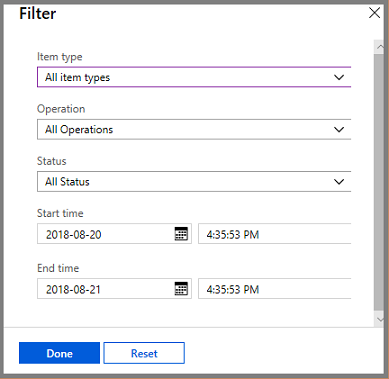 The Backup Jobs menu displays information about the Item type, Operation, Status, Start Time, and Duration. To open the Backup Jobs menu, in the vault's main menu, click Backup Jobs. The list of Backup jobs opens. The Backup Jobs menu shows the status for all operations, on all backup types, for the last 24 hours. Use Filter to change the filters. The filters are explained in the following sections. In the vault Backup Jobs menu, click Filter. Choose the filter settings and click Done. The filtered list refreshes based on the new settings. The day and time that the query begins. The default is a 24-hour period. The day and time when the query ends. Use Export jobs to create a spreadsheet containing all Jobs menu information. The spreadsheet has one sheet that holds a summary of all jobs, and individual sheets for each job. To export the jobs information to a spreadsheet, click Export jobs. The service creates a spreadsheet using the name of the vault and date, but you can change the name. How long does it take for the Azure backup agent job status to reflect in the portal? 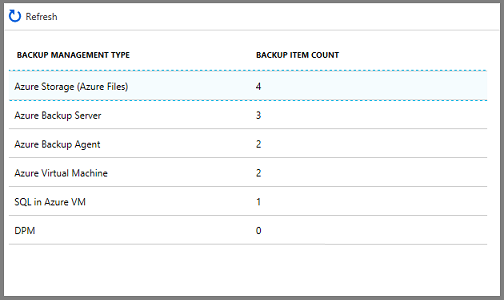 The Azure portal can take up to 15 mins to reflect the Azure backup agent job status. When a backup job fails, how long does it take to raise an alert? An alert is raised within 20 mins of the Azure backup failure. Is there a case where an email won’t be sent if notifications are configured? Yes. In the following situations, notifications are not sent. Issue: Jobs and/or alerts from the Azure Backup agent do not appear in the portal. 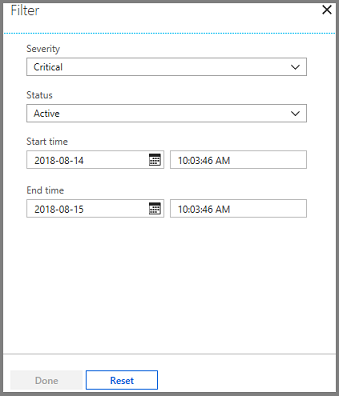 Troubleshooting steps: The process, OBRecoveryServicesManagementAgent, sends the job and alert data to the Azure Backup service. Occasionally this process can become stuck or shutdown. To verify the process isn't running, open Task Manager, and check OBRecoveryServicesManagementAgent is running. If the process isn't running, open Control Panel, and browse the list of services. Start or restart Microsoft Azure Recovery Services Management Agent.